As the second metropolitan centre for the region, Surrey City Centre is transforming into the economic, social and cultural hub of the City. Surrey’s population is 513,000 people and is the third fastest-growing city in Canada. City Centre’s population is 33,660 and is projected to more than double to 70,000 by 2041. Over $12 billion in new construction has occurred in Surrey in the past 10 years. 12.5M square feet of new residential, commercial and institutional space has been built in City Centre since 2000. 1,300 businesses are located in City Centre. City Centre’s current workforce is 25,255 which will grow to 31,759 in 2021. City Centre is almost 600 hectares including 45 hectares of parkland. Connected to the Skytrain rapid transit network and is a 35 minute ride to downtown vancouver. Follow the charts below to see how many people are choosing to live, work and build in Surrey City Centre. Take a look at these interactive graphs to get a sense of Surrey City Centre. Mouse over the data points for more detailed information. 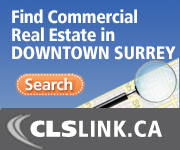 Please visit the City of Surrey’s Business Data for more in-depth statistics. As of 2011, 69% of the population ranges between 18 and 64.